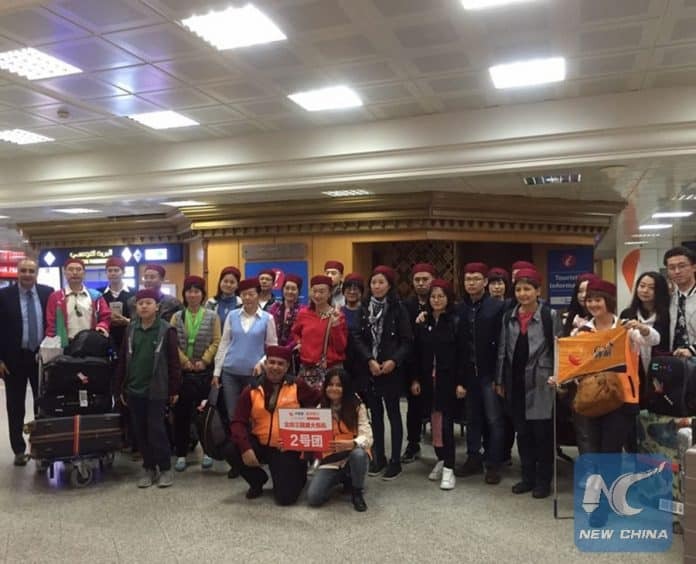 Tunisia welcomes first Chinese charter-flight tourist group - The Maghreb Times ! The first Chinese chartered-flight tourist group arrived in Tunisia on Tuesday, as the North African country expects to attract more people from the world’s biggest tourist market. The trip route of the 165-tourist group, organized by China Youth Tourism Service (CYTS), one of the biggest tour operators in China, covers Tunisia, Morocco and Algeria. Song Chenxi, a tourist group member who works in Beijing, said she was impressed by the “half sea and half flame” of Tunisia when she first travelled to the country in 2012. This is why she decided to take her husband for a second visit to the North African country. “I have posted my photos on Wechat during this trip and got plenty of likes,” she said. Wechat is the most popular social media mobile application in China. According to Chen Guang, a marketing and brand manager from CYTS, the Mediterranean and Sahara Desert are the two aces of the trip. “Tunisia has its unique touristic resources,” Chen said, noting that the cultural diversity is the key to this country boasting seven World Heritage sites dating back to more than 2,000 years ago. “The sale of this trip group is far beyond our expectation,” he added. Tunisia has witnessed a slump in its tourism since 2015 when three major terrorist attacks claimed the lives of more than 70 people, mostly foreign tourists and security forces. In 2017, the sector started to recover slowly as the North African country posted about 6.73 million tourists. “Everything is truly under perfect control now,” Leila Tekaia, the manager of public relations and communication from National Office of the Tunisian Tourism (ONTT), told Xinhua. “Efforts have been made in recruiting security agencies, as well as in training and supervising them. Cameras with 24-hour surveillance have been set in tourist resorts, even in the outside archaeological sites,” Tekaia noted. Last February, Tunisia decided to apply visa-free to Chinese tourists to allow them stay no more than 90 days in the country. Since then, China has become Tunisia’s fastest-growing market, with tourist arrivals rising from about 7,400 in 2016 to over 18,000 in 2017. Tunisia Welcome Service (TWS), a travel agency which has started business with Chinese clients since 2000, said it welcomed over 2,500 Chinese tourists in 2017, which accounts for almost half of its total turnover. “The Chinese customers have a desire to discover the history and the culture and even the gastronomy. In addition, the Chinese have a strong purchasing power and a demand for quality and private service,” said TWS Director General Samir Meddeb. Meanwhile, Amouar Chetoui, the deputy representative of ONTT’s Beijing Bureau, expects the Chinese tourists to Tunisia to increase to 50,000 by 2020. The currency exchange between Chinese Yuan and Tunisian Dinar will be officially put into effect in Tunisia in the coming months and the payment with Union Pay would also be possible, he said. ONTT would launch the National Publicity this year, via the social media and tourism salons, to present the unique charm of Tunisia, Chetoui added. Where does US-Tunisian military cooperation end?